When I made available some photographic divider sets recently, it was suggested that a set featuring Filofax pictures might be well-received. I have always admired the Filofax pictures Deborah (DEM) posts on her blog, Thoughts & Exploration, and asked her if she wanted to collaborate on making a set together. She had the hard job of taking the photos (creative photos that are clear, well lit and composed like hers don’t just take themselves), while I had the much easier job of sizing them on the divider templates. If you want to see all six dividers, you'll have to download a set, but here's a sneak peek of one of them in both sizes. If you want to celebrate your Filofax love, you can download and make your own set. You have the choice between A5 dividers and Personal dividers, and there are different versions for those of you printing on A4 and those using Letter paper. 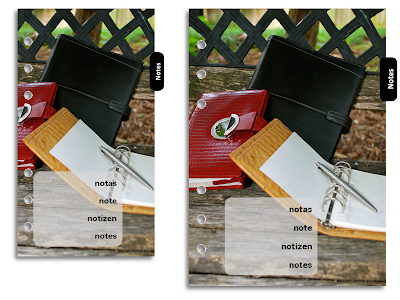 Download the file of your choice, print onto card or photo paper, then cut out and punch the dividers. Why do your words face away from you?? Don't YOU want to be able to see them when you're using your Filofax? Not others to read? I'm confused. Or is this an option so I can print the words facing me? Tina means (I think) the bottom of the letters are on the right side or top of the tab, "facing away" as opposed to the bottom of the letters are on the left or bottom of the tab thus "facing towards" you. Oh I see now. Well, the word has to be sideways, of course, and I think the selection of which flavour of sideways is an arbitrary one. Standard inserts in landscape format choose this flavour of sideways. It's easily changeable, though. The templates are editable and changing this aspect is simply a matter of altering the text direction in the autoshape.